New publisher Guardian Angel Publishing! Groundhog Day in Amazing Grace Acres! Your print copy or eBOOK is available now! get ready to book your Author Visits!! Groundhog Day Celebration at Children of Faith Preschool! I just love the folks at Children of Faith Preschool! Gracie, Grover, and I made a return visit and had such a sweet time! Thanks for inviting me! You were awesome listeners and wonderful singers!! May all your Groundhog Days be full of fun! Author Visits are among my most very favorite things!! I am a teacher at heart, and having a classroom of students around me delights me to the depth of my being. A heartfelt thanks goes to all who welcomed me so warmly!! You made my Christmas brighter! Gracie, Grover and I made our first stop at Children of Faith Preschool in Indian Trail, NC. What a great beginning to our reading adventures this Christmas season!! Then we headed to My First School and Ms. DeeDee's Afterschool! Next stop...CraftyKidz in Hemby Bridge! Our final visit of the season was to Childrens Lighthouse in Indian Trail. Our visits were totally delightful!! Thanks for allowing us to share a little Christmas cheer! Yes! 'Tis the season for all things Christmas!! And that includes Christmas books! Around my house, it's a yearly tradition to pull out the basket of Christmas books gathered over the years, cuddle up near the tree, read, and reminisce of years gone by. Do you do that at your house?? What a blessing to have a book of my own to lie among the stacks of Christmas favorites!! Grover Groundhog Is Not Hibernating This Christmas! are always available and always in season! Wonderful gifts for any occasion...birthdays, baby gifts, Christmas! Just contact me and I will personalize with a note for the recipient of your gift and autograph it. The books are $10.00 each/plus shipping and handling. Groundhog Day At NC Museum of Natural Sciences! Our class had a grand time of learning, exploring God's wonders, and lots of groundhoggy fun at the NC Museum of Natural Sciences on Groundhog Day!! Sweet siblings joined in the festivities too! A highlight of the day was spending time with Denise Shadduck and Lolly (aka Sir Walter Wally)! Denise is so sweet and is so gracious to let me spend some time snuggling with Lolly! Oh yeah! I was delighted!! And she endorses my book! In fact she took a nibble of one copy. Our hats were the fine work of my wonderful assistant, Julie Clary!! Waiting for the official ceremony at the NC Museum of Natural Sciences!! And just so you know, that's Punxsutawney Phil peeking out of that bag! And Grover was there! Gracie was there (waaay down in the corner). Somehow she didn't get in the pictures! Oh No! And then the big moment!! Raleigh's Mayor Nancy McFarlane made the big announcement. Six more weeks of winter!! But this year, winter has been good to us. It was a beautiful day to be outside enjoying the beauty of God's creation...groundhogs and all!! Groundhog Day is Coming! Fun Facts for You! Are you goofy about groundhogs?? Check out this great info and you’re sure to be! They are so cool! · Groundhogs are marmots and are members of the rodent family. People (like me!) who love groundhogs are called marmotophiles. People who study about groundhogs are referred to as marmotologists or marmoteers. · Groundhogs have other names…woodchuck and whistle pig. They are called whistle pigs because of the shrill whistle they sound to warn their friends of danger. · That whistle is not the only way that God gave groundhogs to protect themselves from predators. They have a strong sense of smell. They can smell if any predators have been near their burrow. · Groundhogs are very alert and can peek from their burrows without being noticed. Their eyes, ears and nose are high on their heads for great spying. · Groundhogs can also make a loud chattering noise with their teeth that scares enemies, which include wolves, foxes, coyotes, and eagles. · And speaking of teeth, a groundhog’s teeth keep growing and growing and growing. They use their teeth to help dig their burrow. They can chew right through roots and even rocks! That gnawing keeps the teeth at just the right length. · Groundhogs are amazing diggers!!! The can move about 700 pounds of rocks, roots, and dirt in one day!! · Groundhogs dig with purpose. When making their burrow, they go down a few feet and then back up a bit, making a flood bump which protects the burrow during storms. God made groundhogs really smart! · Their burrows have a main entrance and alternate exits and spyholes. They have multiple “rooms” including a nest for snoozing and hibernating and a potty room. · Groundhogs eat like pigs all during the summer to build up lots of fat for their hibernation. After the first frost, they head into their burrow and sleep until spring. · During hibernation, groundhogs barely breathe, only about once every six minutes. Their hearts only beat once every four or five minutes. That’s deep sleep!! · They eat grasses, leaves, fruits, tree bark, clover and crops…which keep them from friendship with farmers. · Groundhogs live in places where trees are near to open spaces, often close to roadways and streams. Groundhogs can climb trees and can swim, but spend most of their time on the ground. 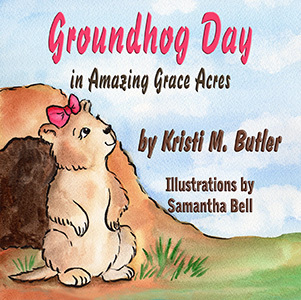 · On February 2, Groundhog Day is celebrated! On this day, groundhogs from all over the country are pulled from their homes to see if they see their shadow. According to tradition, if he sees his shadow there will be six more weeks of winter. If he doesn’t, then spring is on its way!! Write2Ignite! Click icon for info! Thankful for God's unfailing love, tangible presence, and that He would see fit to will and work in me for His good pleasure...it is surely a matter of grace! It is my prayer that I honor Him in all I do. He has blessed me with a wonderful heritage through the example of my parents who love God, walk with Him, pray fervently, and love others unconditionally. He gave me an incredible, generous, gifted husband who works for the Lord with all of his heart. My "little girl dreams" of being a Mommy have been realized through our 4 wonderful daughters, who have proved that there is "no greater joy than to [know] that my children are walking in the Truth." I am honored that He would allow me the privilege of having taught His precious children in several wonderful Christian schools. I wait expectantly to see what The Dream Giver has in store as He leads in pursuit of service to Him through the written word.